Used to when people would click to load the matterport 3D a screen (overlay) would show up and tell people to use their arrow keys. I never see it anymore?? What happened to it?? The easiest way to ALWAYS show help is to use a 3rd Party Content Management System to manage your models. For example, we use WP3D Models that has a check box to set the default to ALWAYS or NEVER. "The help screen will display the first time a Matterport user loads a model," according to Matterport Support. "To ALWAYS show help, add the &help=1 parameter following the model string." Hi @lisahinson - Matterport models only show this on a user's first view. However, you can "force" show it on specific models using a link "attribute". 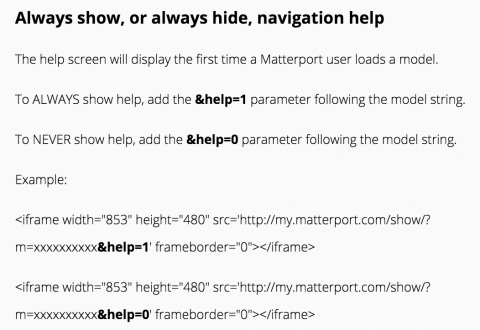 I don't currently have access to the link on Matterport's site that displays all of the various attribute options - @dansmigrod, can you post that in a comment here? Oh wow - during the time I was typing (on my phone) all that already happened. Nice work! !